The Gr.3 Manfred Stakes is the feature event at Caulfield on Saturday and we are looking forward to the promising three-year-old Tulsa resuming in the $150,000 contest. Having his first run since finishing eighth in last spring's Caulfield Guineas, the Sebring gelding has been pleasing us in his work and we are expecting a bold showing. "He has finally drawn a good gate," Michael Moroney said, noting that tricky draws saw Tulsa get a long way back in his spring assignments... "from barrier five he can be closer up in the running." Maturing doing his spell, Tulsa as jumped out well and is "well forward for his first up run." We have a couple of nice three-year-olds heading to Sale on Sunday, the first of which is Keen Desire who contests the third race on the card, a 1205m maiden. Getting a fair way back from a wide gate when unplaced at her Geelong debut in early January, the Wanted filly has struck "a pretty strong maiden" but this time has fared much better with the barrier draw, to jump from gate four for Jake Noonan. "We've added the blinkers to help switch her on and whilst she may be looking for 1400m we are expecting her to run a long way better this time." Wichita Woman, who contests the following race, is having her first start since racing at Gr.3 level last October. To be ridden by Nick Hall, the daughter of High Chaparral showed plenty of ability during her debut campaign and should not remain a maiden for much longer. "All things being equal she should win," Moroney enthused. "She has jumped out well and she is a lot stronger a filly this time in." 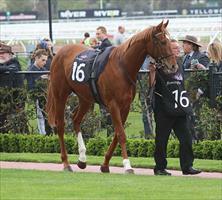 We also have a runner at Tatura on Monday, Rising Stock taking his place in a BM64 mile contest. Disappointing last time out, inclined to over-race after striking early interference, he had previously been racing as though the 1600m would suit and we are looking for an improved performance. "Hopefully he can relax on pace and run a much better race."